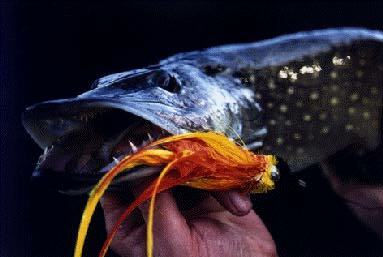 An Irish pike caught by the author on a streamer. On a cool November morning approximately 25 years ago, a small number of creative fanatics invaded a dutch polder with the proclaimed aim for experiencing novel fishing adventures. On the occasion of this memorable November morning, fly fishing for the elusive pike was born. It is especially noteworthy to mention these facts as, until the end of the sixties, nobody had ever attempted to catch a pike on the fly. It was the start of a new era, the long search for the adequate equipment and productive flies. From time to time a pike will come out of its hiding place to prey on a frog or a duckling. Every moving object catches its attention. For the pike feeding is part of its survival instinct. Lure fisherman now for a fact that it is conceivable to tempt carnivorous species with artificial bait. Thus, there should be no hesitation to try to seduce a nice pike with a large artificial fly which underwater is a very good imitation of its favourite prey. Indeed the elusive esox lusius could be tempted with a fly. On the other hand, the Netherlands with its clear-water polder arms is only one hour away from Belgium and offers the worlds most suitably adapted fishing areas for the hunting of pikes with a bunch of feathers. Many fly anglers will however scrutinise the idea of pike fishing with a streamer as it consists of a unique experience and brings a new dimension to the sport of game fishing. Winter fishing is an occupation for which most angler are ill-prepared. Being lost in the flat polders on a cool and rainy winter day requires courage and tenacity. My great friend Albert Drachkovitch fighting a polder pike. Imagine you are confronted with a kilometer long wateringe. The wind is blowing a wave which hits the bankside vegetation, adding to the grey winter atmosphere. A legendary polder in the winter season lies in front of you. Under the surface of these turbulent waters a fight of life and death is raging. Coarse fish are desesperatly seeking refuge from the voracious pike who is hunting relentlessly, preparing for the spawning season which will ensure its descendance. "A strike, a wave, the pike has engulfed the fly"
the lure travels another few meters before a short and heavy thump on the line. A strike, a wave, the pike has engulfed the fly. In a matter of seconds, the fish realises that he has been lured and starts a desperate fight for freedom by seeking refuge in a deep pool surrounded by bankside vegetation. The rod bends dangerously, its fibers screaming in response to the heavy thumbs of the fighting pike. 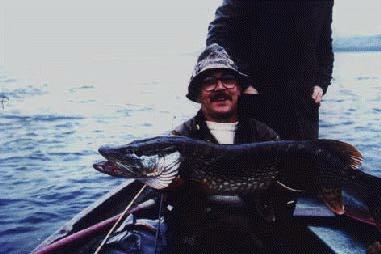 For ten or twelve meters the pike swims while shaking its head to get rid of the hook, but to no avail. He suddenly decides to move to the surface and jumps out of the water like a dolphin, offering a first glance at its respectable size. Finally the fish shows signs of fatigue and loosens its resistance. Devoid of his forces, the courageous opponent understands that the fight is over. Eye to eye contact with your opponent. "He does not realise that his life will be safe at the end of the fight"
Carefully you get hold of the fish by grasping him behind the gills and with a gentle movement you extract him from the water. After laying the fish on the grassy bank you proceed by measuring its length and taking the hook out of its mouth (mind your fingers) before releasing him into his natural environment. In a matter of seconds he disappears into the depth of the pool. First class fly fishing in the middle of winter. If you have never tried it before, it is probably difficult to imagine the sensations associated with fly fishing for pike. Wether you are a game angler or a fly fisherman, surely you must try it sometimes or you could miss something difficult to describe. You will gain a fascinating experience, the emotions and adventures associated with hunting as well as a fantastic winter alternative for a sport considered to be limited to the warmest days of the year. The only danger is that you may become addicted to it. It is a risk worth taking. 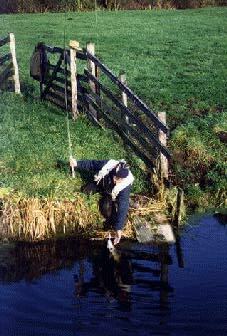 Accept the challenge for a few days and put this technique to the test in the dutch polders. A golden catch as described previously is waiting for you to be taken. I undoubtably recommend this winter occupation. Leader: Tapered "Rafale" leader: 90 cm of .60, 50 cm of .50, 35 cm of .40 followed by a small swivel to which a 40 cm stainless steel line is attached (Force 7 by Drennan) and finished with with a streamer attachment system from Mustad. Reel: A good and solid reel containing 50 m of backing. Flies: Large coloured streamers (yellow, white, orange, chartreuse), heavily dressed with tinsels and flashabou. Tied Matuka style on a 6/0 hook. 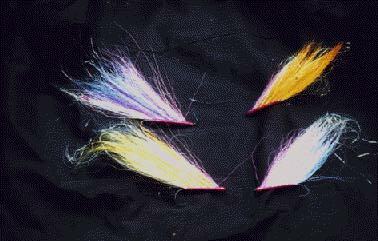 Several types of streamers for pike fishing, adapted for the polders.